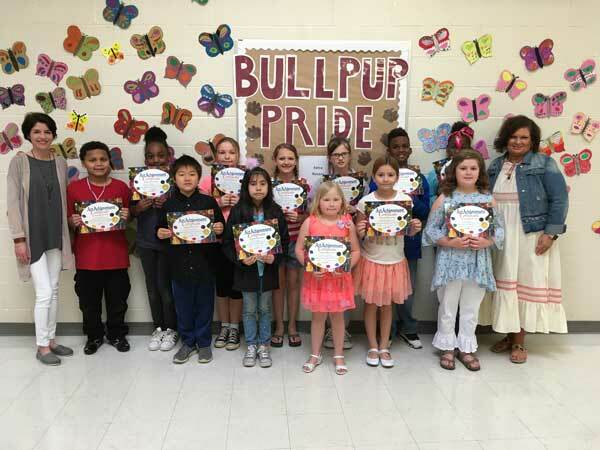 New Albany Garden Club art contest winners. New Albany Garden Club sponsored the Smokey Bear & Woodsy Owl poster contest at New Albany Elementary School. back row l-r: Emily Murff, NAES Art Rotation Teacher; Lorenzo Ingram, Elana Crayton, Allie Bullock, Chloe Hudson, Shelby Morris, Donovan Pulliman, Shanya Isom, and Danita Mattox, New Albany Garden Club Member. Lorenzo Ingram was the overall winner of the Woodsy Owl poster contest. Donovan Pulliman was the overall winner of the Smokey the Bear poster contest.